Could Garner move before the window closes? Whalley’s Joe Garner could be on the move ahead of this evening’s transfer deadline. The Ipswich Town striker, formerly with Blackburn Rovers and Preston North End, is a target for Bolton Wanderers, who have made a six-figure bid for the 30-year-old’s services. But new Tractor Boys boss Paul Hurst has admitted he may yet decide to keep hold of the combative frontman . Hurst is wary of his need to bring in at least one striker before the window closes at 5 p.m., with last season’s top scorer Martyn Waghorn likely to move on, and has lodged bids for Blackpool’s Curtis Tilt, Accrington Stanley’s Kayden Jackson and Cardiff City’s Omar Bogle. 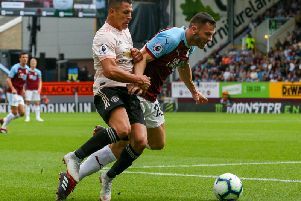 Garner was not involved in Saturday’s 2-2 draw at home to former club Blackburn, due to a minor knee problem, but speaking after the game, Hurst said his departure was by no means a given. Millwall and Sheffield United are also believed to be monitoring Garner’s situation, and reportedly have both enquired about Garner in the last week. Bolton boss Phil Parkinson has confirmed he is keen on bringing the former Rangers man back to the north west, but also has other irons in the fire: “He’s a player I’ve admired since his time at Preston. Blackburn-born, Garner started his career at Rovers, before joining Carlisle, after a successful loan spell, in 2007 for a club record fee of £140,000. A year later he joined Nottingham Forest for £1.14m, and he has also had spells with Huddersfield Town, Scunthorpe United and Watford.